"According to a report from Business Insider’s BI Intelligence research service, the US same-day delivery market could grow from $0.10 billion in 2014 to $4.03 billion in 2018 at an annual growth rate of 150%"
In today’s world of online retail, logistics play a key role in defining the future of e-commerce players. Adding delivery zones, local delivery options and same day delivery is key to providing a faster, more efficient service to your customers. 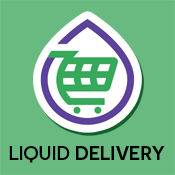 Liquid Delivery tightly integrates with your Lightspeed web store's checkout process to add additional options specifcally tailored to businesses offering direct delivery to their local markets. Lightning fast install, set up your first zone in minutes. Quickly create and manage your In Store Pickup locations. Easy interface for simple use cases, but access to powerful rules and advanced options. Offer add on services like Same Day Delivery. Incentivize larger purchases with discounted delivery based on order totals. This app supports US locations in USD currencies and Canadian locations in CAD currencies. Liquid Delivery is a product of Liquid Retailer, part of the Socom Media family of technology companies. Liquid specializes in helping small to medium sized brick and mortar retailers make the jump from offline to online success in their local markets.